I was a Sad Santa on Sunday. I did have some reservations on the walk down to the start, though. And yes, I did walk a mile down the Hotwell Road at 10am on a Sunday morning dressed in a Santa costume. There was hooting involved. And some occasional pointing. Not to mention half the police in the South West driving past on their way to their afternoon’s student demo (my pics of that here) crowd control duties. That was a bit odd. The lack of Santas when I got to the Amphitheatre was a clue, and my suspicions were confirmed by a couple of the organisers greeting me with disappointed faces and the news that the route was just too icy to be safe. The Amphitheatre itself had pretty much been a skating rink when they arrived to set up, and the rest of the route — especially Pero’s Bridge, often a curve of slippery metal in Winter — were still un‐runnable. 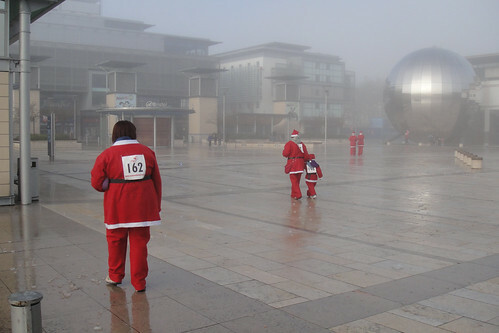 So, I and the other Santas who’d not heard the cancellation announcements on local radio headed off across Millennium Square, pictured above, to the kind, warm interior of The Living Room, a fashionable and lovely bar who gave a free hot drink to anyone in a Santa suit that morning — thank you! After a commiseration drink with my friend José, who’d come along to support me, I drifted back home, still be‐Santa‐suited, and still garnering the odd confused look and occasional cheery hoot. So, thank you, kind sponsors, for sponsoring me, and rest assured I still intend to run 2K as Santa, no matter what time of year it is when it’s finally safe to run!